Yelp says it now has more than 57,000 active business accounts, up from 35,500 a year ago — a 61 percent increase. These are defined as accounts from which Yelp made money during the quarter. 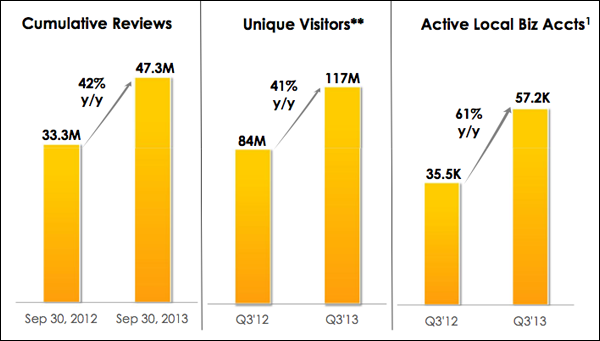 Reviews jumped from 33.3 million a year ago to 47.3 million at the end of Q3, a 42 percent gain. I should note that a small portion of the growth is due to Yelp’s ongoing integration with the European review site Qype that it bought last year. Mobile Yelp Searches: In the latest quarter, Yelp says 62 percent of all Yelp searches happened on mobile devices. That’s up from 45 percent a year ago. Mobile App Usage: Yelp says its mobile app was used on 11.2 million mobile devices in Q3, up from about eight million a year ago.